How to Tell if Someone is Lying: Lies told by Mouth and Emotion explained by Dr. Matt, Ph.D. Contrary to the impression given on popular television shows, the degree to which Lie Detection is successfully done by observing non-verbal, body language is greatly exaggerated. Lie Detection can happen at higher levels of reliability by applying principles described in my book, "Changing Your Stripes." But the primary intent of my book is NOT to detect the lying behavior of others (although you could do this), but to detect the lies that you are telling to others, and to discern the lies you are telling to yourself. It is often hard to catch yourself telling and living lies, because you and I will "lie" unwittingly; meaning, we lie, but we do not know that we are lying. These betrayals of truth are not always just lies told by the mouth, but usually lies manifest via emotion. The Emotional Lies that we Live, are the hardest lies to discern in yourself, yet quite easy to see in others. When you have a problem, but don't realize you have a problem . . . that's a problem! How could you ever solve a problem, if you don't think you have a problem? The blindness of being unable to see yourself living a lie is called "Self-Deception" — Freud called it "Denial." in a problem. Facing the Truth is the key to metamorphosis." The built-in bias for psychological research is to look for physical correlations: How does lying relate to factors of body-language, genes, dna, brain chemistry, etc — that's Psychology. But there are more reliable correlations to be found beyond physical confines: specifically, paying attention to tell-tale signs within verbal-language and human relationships — that's Social Psychology. According to Miller and Stiff (Deceptive Communication, 1993) the reliability of body-language cues for detecting deception is no better than a flip of a coin. Further, Ekman and O’Sullivan (1991) found that people in occupations where detecting deception is advantageous (federal polygraphers, judges, crime scene investigators, and psychiatrists) were not more accurate at detecting deception than average college students. 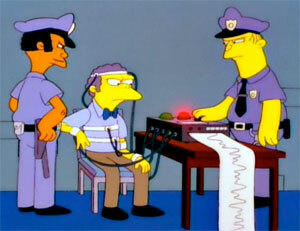 In his book "The language of confession, interrogation and deception," Roger W. Shuy concludes that "human beings are not good lie detectors." What follows is a list of Body-Language Signs of Deception — signs that you and I may be lying. But remember, these signs are as reliable as a coin flip. After this list, I detail highly reliable Tell-Tale Signs of Deception. This tell-tale sign is not always reliable because, for example, telling the truth is often accompanied by a lack of eye contact. Admitting the truth when you've made a mistake, is often a hard thing to do; here, lack of eye contact correlates to guilt and shame . . . and NOT lying. Also, Liars who are aware that “Eye Contact” is the #1 sign of lying, they may try to defeat detection with too much eye contact -- eye contact that seem unnatural and contrived. paradoxically, Giving Too Much Eye Contact can be a tell-tale sign of Deception. Is the person lying, or does he or she have a speck of dust in the eye? You need a "base-line" Blinking Rate to compare against, if this indicator will be valid. Some people naturally blink a lot, while others . . . not so much. High or low vocal tones may correlate to tight underwear. Excessive pausing may indicate that a liar is making up a story on the fly, or it may signal that a person is simply not articulate. For example, consider a sports interview: most of the time athletes are NOT lying, but some athletes are also NOT articulate either — hence "pausing" is present in their speech. Hands touching the Face, Nose, or Mouth are typical signs of lying, BUT itching and stroking the face can happen because a person has allergies. Remember, people are often nervous at the prospect of telling the truth; thus, this Tell-Tale sign of Lying, along with the others mentioned here, are as reliable as a coin flip. Defensiveness definitely indicates something: While the "defensive" person may not be telling a lie in a defensive moment, he or she is likely living a lie — people who live in alignment with their own inner truth exhibit peaceful emotions, not defensiveness. Body Language is guarded. The body of the liar may turn away or fold arms or cross legs to create a defensive shield. Liar may try to change the subject to defect attention away from topic tied to their guilty behavior? On the other hand, people will change the subject because they are bored with the topic of conversation. So, is a person Lying or just Being Bored. As the astute observer combines multiple signs of deception, the probability that a person is Lying goes up. People who use excessive Sarcasm and Humor, may be Lying; hence, they try to cover the seriousness of a sensitive moment with levity? On the other hand, you may be in the presence of a person who tends to be a comedian generally? This is why a BASELINE of behavior must be established first, so a comparison can be made between what you are observing in the moment . . . and how the person is question normally behaves. Because they are making up a story as they go, Liars slip up with details that don’t match reality. On the other hand, a person be making a honest mistake . . . a misstatement. Observations over time will tell the tale! Saying one thing with the mouth, but body language is incongruent. For example a person might say: “Yes, I really want to go with you” (but the non-verbal cues show no excitement for the idea). Also, a Lying Person may do just the opposite (because they are Lying), they contrive excitement with fake smiles and fake enthusiasm as visual evidence to support their Lie. This may be a sign of Lying, or it may point to a person merely being inarticulate. Again, if you want to detect signs of Lying, you need a baseline of behavior from which to compare. Remember, some liars are very articulate and verbally smooth — they've learned to be verbally skillful through much practice, to compensate and cover their deceptive intentions. When confronted with a direct question “Are you lying to me?” . . . liars will typically become uncomfortable, and do some of the body-language signs of deception; in contrast, an innocent person may simply say “Of course not” — with no defensiveness or hesitation. Even when a person is NOT lying in a particular instance, if they are “Living a Lie” in their life generally, then the direct question “Are you lying to me” may result in that person taking offense — and becoming "defensive." People who consistently live with honor and integrity do not waste time in taking offense. So when a person is NOT lying, the kind of approach you make creates a constraint that can bring about Defensiveness — again, the person is NOT lying, but merely responding to YOU in the moment! This partially explains why many false confessions and inaccurate information comes during aggressive interrogation. People behave IN RESPONSE to the conversational context that constrains them: Because a person is trying not to hurt you, he or she may speak deceptive words so YOU won't get upset or disappointed at a straight-forward answer. Certain brain-oriented psychologists believe that looking up and to the right triggers the part of the brain linked to the imagination. Conversely, when someone looks down and to the left, he or she is activating the section of the brain associated with memories. 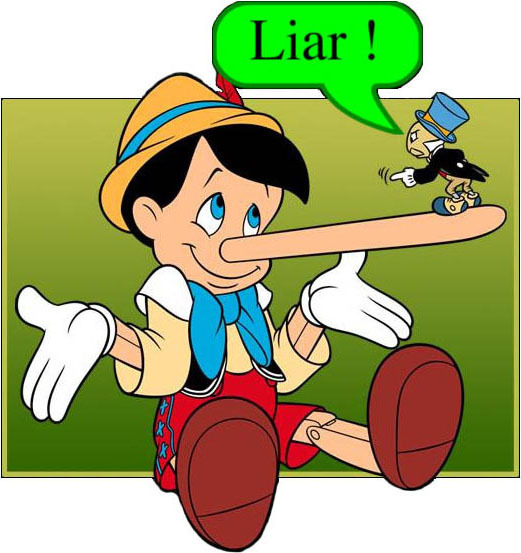 Nonverbal cues previously identified are Signs of Lying "on average" — this is how many, but not all, people are liable to behave when Lying. Such generalizations will NOT necessarily apply to a particular person. To illustrate, imagine a group of 1000 men and a group of 1000 women, and you know that, on average, the men are 2 inches taller than women. Now, assume that you find out that a person is 5'9". Based on that information alone, can you tell with any certainty, whether that 5' 9" person is a man or a woman? Why not? This is the problem with "averages" and "generalizations." This means you cannot consistently apply generalizations from a large group to make claims about specific individuals. Remember, there are tall women and short men, and all sizes in-between. Hence knowing someone's height, by itself, is not conclusive information for trying to a person's gender. In the same way, the previous body-language cue for "lying" will not always apply. 1) Avoiding trouble; the trouble that a Liar may have caused in the first place. 2) Increasing power and influence over other; power that appears only temporarily. 3) Selling a superficial self-image the Liar desires to project, but isn’t genuine from the heart. 4) Gaining more material possessions; getting more things that eventually rust and rot. Lying is a function of selfishness: a way of living that is opposite to that which brings true self-fulfillment and happiness in the long run. We lie at the price of our integrity and honor -- our quality of character -- the only thing we do take with us when mortal flesh dies and our eternal soul lives on. The following are superficial non-verbal cues that may indicate that a person is lying. I say “may” because unless a baseline for behavior is established, you cannot discern whether the cues characterizes behavior outside of that person’s norm. For example, certain people may have allergies that cause them to rub their eyes or nose -- which can be a nervous twitch indicating a lie - but in this case, it indicates allergies. Most lie detecting experts agree that a combination of body language and other cues must be used to make an educated guess on whether someone is telling the truth or a lie. discerning deception in the lives of others. Instead of owning response-ability, the person in betrayal typically tries to explain away the troubles at hand: Justifying self while Accusing others is a tell-tale pattern of those trapped in betrayal; they also become embroiled in Resenting emotions and rationalize, "because others have made me miserable . . . begrudging my abusers is what anyone would do in the same situation." Indeed, most "anyone" would begrudge their abusers, but being average is not our aim. Changing Your Stripes is about excellence! Whenever accusing and self-excusing words emerge, words laced with a resentful agitated edge, THEN you may know with certainty that a betrayal is in progress! The outward behaviors of the J.A.R. expose the inner imbalance of the heart, . . . inner conflict called betrayal. It's hard to See in the Dark. As the sun sets beyond the horizon, its light grows gradually dimmer. With the onset of darkness, the ability to see become increasingly impaired. Like physical vision, our spiritual vision is also obscured as we leave the Light of Innocence; for it is from the abundance of the heart that the eyes see. When our heart is out of harmony, we cease to see clearly. Diminished vision is the unavoidable result of walking in the shadows of betrayal. Because we no longer see through innocent eyes, we perceive a different world. We see differently, not because the world has changed, but because we have changed. When caught in the trap of betrayal, we encounter the connected consequence of diminished vision; betrayal and blindness always occur together. People will not even attempt to correct a problem if they don't think they have a problem—yet they do . . . and are blind to it! Thus, in order to solve any problem, . . . a paradigm shift is required! A shift from the way of thinking that was capable of creating a problem in the first place, . . . to a way of thinking that can perceive a new perspective. Further, thinking that you can solve Life's most important problems with your "thinking" . . . is itself a problem. When confronted with a crucial issue, people often say, "I need to figure things out . . . I need a strategy." Using your head is a good approach for solving problems of algebra, but not for solving problems of anguish. Indeed, the mental mind-set used to create a problem cannot be used to solve it! As long as the head is disconnected from the heart, betrayers will solve their problems in precisely the wrong way. Beset with a blinding mental block that breeds more perplexity, people afflicted with Einstein's Mind Bind (which is everyone to some degree) are more prone to problem-making, than problem-solving. In the experience of betrayal, inner conflict is characterized by repetitive thoughts that grind round and round in one's head: Figuring, conniving, strategizing, these are the ways solutions are sought while in betrayal. Being inwardly unsettled, an urgent need to bring things back into balance is felt. Constant mental reruns represent a betrayer's attempt to bring things back into balance; but all such attempts are futile while trying to use the defective head that hatched the perplexity in the first place. Such repetitive mental dredging is also called "Obsession." Some might suggest you have a disease, a psychological disorder, when really you're just doing and feeling dis-ease because of a spiritual dis-order: You've lost Life's inherent harmony. By choosing to resist the spark of inner goodness that guides, Life's inherent harmony is lost. Through our own conflicted thoughts and feelings, Life spontaneously lets us know that we walk in darkness. And when in darkness, we lack the clarity of vision that is amply enjoyed in the Light. Through darkened eyes we misperceive our world. Every solution contrived by our head ends up wrong, and will continue to be wrong as long as the head is out of harmony with the heart. When you're blind and in betrayal; the tell-tale signs of the JAR provide you, . . . a corrective clue. Self-justification has been a tell-tale sign of betrayal for a few millennia: "If I justify myself, mine own mouth shall condemn me" (Job 9:20). People who fall in the trap of betrayal feel an itching need to rationalize their contribution to a quagmire. Betrayers invest much time and energy into telling anyone who will listen, why they are justified in their attitudes, actions, and emotions; they assemble a self-justifying facade so they won't look bad, . . . when really they have been bad. Betrayers tell a self-excusing story to convince themselves and others that they are OK and that blame lies elsewhere; they spin a tale that tries to make the wrong they are doing appear right, or at least not their fault. The very act of rationalizing reveals a betrayal. It is precisely because of inner imbalance that people get involved in a Justifying pattern. Justifying is only useful to those who are out of balance. Rationalizing has always been easier than admitting mistakes; it is the road of least resistance, and least effort. It is the crowded course traversed by a mediocre majority. Telling Stories: Anxious vs. Honest. People who betray their intuitions of innocence have a story to tell! But not all who have a story to tell are betraying themselves. Some stories are just . . . stories. With no inflamed emotion, some stories explain events and occurrences with straightforward frankness; no blame, no irritation, no resentment exists in the telling of an honest story. It is a story that explains and may even entertain. This type of story will mostly go away the following day . . . for it has no reason to stay. That is, unless you really like it, then you might file it away . . . and enjoy it on another day. The anxious story, in contrast, is more than a simple explanation of things and happenings: It's an unsettled story that arises from a mire of internal conflict. It tends to be told over and over, because the teller of the anxious story finds no emotional closure in it. Thus, neither the story nor the flustered feelings go away in coming days, instead, reruns and sequels continue, and such repetitive "broadcasts" reveal the inner conflict of the producer/storyteller. Basically, there are two types of Stories that people tell: One Honestly and Simply Explains and the other Anxiously Excuses and Accuses. One indicates Truth, the other Betrayal. Because the story hides a lie, . . . there is no peace or closure in it. and sprawling. It continues in a new day, . . . and does not go away. The anxious story yearns to appear convincing, it seeks to be backed by facts; it needs to be lined with logic. The anxious story clings to factual evidence to compensate for the inner insecurity of the storyteller. The anxious story requires airtight logic to make secure, an inherently insecure story. Conversely, the honest story is more or less succinct and needs no long, involved logic. Because they have no inner turmoil to resolve, people who tell an honest story speak candidly with no agitated edge of emotion. The honest story does not try to manipulate or pretend, and it may even be a little awkward or goofy. It is not premeditated or polished, because honest storytellers have no motive to appear impressive. The Honest Story will BE, whatever it IS because "that's the way things happened." A False Solution: Blame as Balm. When spinning self-justifying stories, we portray someone else or something else as being at fault. But what good does this do? To think that Blaming Others might bring relief is the accuser's misleading illusion! Even if others are completely blameworthy, motives of revenge, resentment, and rationalization only serve to poison the heart of those who harbor inflamed feelings. In the name of justice and closure, betrayers embark upon a crusade of accusation against offenders. But when such a crusade is cankered with accusing emotions, blame brings no healing balm to a wounded soul — instead, fretful feelings make the wound wider! Blaming Situations is equally fruitless! It is tempting to think, "if only I could escape my sad situation, then I could be happy." But a change in circumstance is rarely a favorable fix when one continues in betrayal. EVEN IF you move to some enchanted island, but you have not yet recovered, you end up bringing your old unenchanted self with you. This means you bring to a new location your same old bag full of problems. Old habits die hard even in new locations. Like a mouse trap ready to snap, old propensities just waiting-to-happen will erupt, even on some enchanted island. Because Life is a Set Up, you can expect selfish people and distressing events to impact your Life. Life is filled with frustrating twists and turns: Get used to it, get over it, and get on with it! That's Life! While such stressful constraints will explain the Set Up to which you are exposed, if you would Be True from this day forward, you won't point to those constraints for excuse--you will live without accusation. to me, and there are bad things that I do. Because other people have wronged us—or we imagine that they have wronged us—therefore, our plight must be their fault. We falsely conclude that we are justified in harboring hatred towards offenders. While perpetrators may be directly responsible for causing abrasions and intrusions beyond the perceptual participation and choice of the abused, yet those victimized by misfortune still have Response-Ability; they author all responses of word, deed, mind, and emotion—to include the response called resentment. Re-Sending Negative Energy. Resenting other people, or situations, is a re-occurring activity: After someone has been mistreated and the opportunities of a new day arise, instead permitting fresh feelings to invigorate, the resenting person engages in re-sending negative energy. Choosing to re-send resentment is today's decision that squashes tomorrow's opportunities. Those who re-send hateful energy may hold in their head an erroneous idea, that harboring hateful feelings sends psychic arrows back to abusers; they may imagine that arrows of anger will somehow pierce and punish offenders. This idea is completely and paradoxically . . . false! The re-sending of resentment does not send psychic arrows out, but sends out boomerangs . . . that come back; thus returning all the bitterness sent and "re-sent" — surely this is the etymology of the word re-sent-ment. skewed; It is wrong, because I am wrong.